Things seem to come in cycles. We have been at this for some years now – trying to articulate the principles of Modern Monetary Theory (MMT) in various ways in various fora. There is now a solid academic literature – peer-reviewed journal articles, book chapters in collections, and monographs (books) published by the core MMT group and, more recently, by the next generation MMT academics. That literature spans around 25 years. For the last 15 odd years (give or take) there has been a growing on-line presence in the form of blog posts, Op Ed articles etc. More than enough, perhaps too much for people to wade through. Each period seems to raise the same questions as newcomers stumble on our work – usually via social media. The questions come in cycles but there is never anything raised in each cycle that we have neglected to consider earlier – usually much earlier. When we set out on this project we tried to be our own critics because our work (in this area) was largely ignored. So we had to contest each of the ideas – play devil’s advocate – to stress test the framework we were developing (putting together pieces of knowledge from past theorists, adding new bits or new ways of thinking about them and binding it all together with interesting and novel connections and implications). So it is continually testing one’s patience to read the same criticism over and over again. Please do not get me wrong. When these queries are part of the learning process from a reader who is genuinely trying to work out what it is all about there is no issue. Our role as teachers is to see each generation safely through their educative phase in as interesting a manner as we can. But when characters get on the Internet, some with just a year, say of postgraduate mainstream study and start making claims about what we have ignored or left out or got wrong then it can be trying. Ignoring them is the best strategy. But then the genuine learners get confused. So this blog post is Part 1 of a two-part series seeking to help answer two major issues that we keep being asked about – (a) Does MMT only advocate tax increases to fight inflation? ; and (b) How can any meaningful jobs be offered in a Job Guarantee if the workforce is ephemeral by construction? Part 2 will come tomorrow. This is the sort of rubbish that is on the Internet about MMT, more or less, every day at present. The first character is an economics PhD student at a low-tier US university. He has a long way to go. The second is not an economist but thinks he knows all about it. Apparently, MMT academics have no formal training in economics and I am a crank, etc. This is what goes for informed discussion these days. Pity the world. 1. An MMT response to Jared Bernstein – Part 1 (January 8, 2018). 2. An MMT response to Jared Bernstein – Part 2 (January 9, 2018). 3. An MMT response to Jared Bernstein – Part 3 (Jamuary 10, 2018). 4. Planning public works – history has a lot to say if we listen properly (January 30, 2018). 5. Functional finance and modern monetary theory (November 1, 2009). If the Job Guarantee is meant to be a flexible buffer stock and workers can be bid out of it on any day by non-government employers, surely the sort of work that is possible under those circumstances must be fairly unimportant and dispensable. The impolite version of the question is that the jobs must just be an unproductive waste of time. I considered many aspects of this question in this blog post – Boondoggling and leaf-raking … (April 22, 2009). In 2008, my research centre (the Centre of Full Employment and Equity – CofFEE) published a major report – Creating effective local labour markets: a new framework for regional employment policy – that followed three to four years of research. Chapter 13 considered the Job Guarantee as an integral part of the proposed framework and provided a very detailed model of how such a policy intervention could be effectively implemented. We considered the possible ephemeral nature of Job Guarantee workers in detail. I have also written several academic papers about this issue (in part). To really get a feel for the issue we have to take a step back. This will also help us understand the wrongful, but often repeated, assertion that inflation control in Modern Monetary Theory (MMT) relies exclusively on tax increases. That will be the topic of Part 2. The orthodox approach to inflation control using buffer stocks of unemployment is costly and unacceptable. The neoliberal solution to the resulting unemployment is to pursue supply-side policies (labour market deregulation, welfare state retrenchment, privatisation, and public-private partnerships) to give the economy room to expand without cost pressures emerging. Progressive economists, in general, reject this strategy because the sacrifice ratios are high and the distributional implications (creation of an under-class and working poor and loss of essential services) are unsavoury. Many economists working in the heterodox tradition advocate ‘Keynesian’ remedies as an alternative. Specifically, they advocate ‘generalised’ fiscal and monetary expansion mediated by incomes policy and controlled investment as a solution to unemployment. A simple construction of this view is that government fiscal policy injects new net spending into the economy whenever non-government spending falls below the level necessary to maintain full employment. Conversely, when total spending is above the level necessary to maintain full employment the government cuts its net spending contribution. Please read my blog post – The full employment fiscal deficit condition (April 13, 2011) – for more discussion on this point. Under the generalised expansion approach the government ensures spending is sufficient to purchase all available output by the government itself purchasing goods and services at market prices or by the government providing incentives to profit-seekers to expand activity through tax cuts, subsidies etc. Both policy measures will be conducive to employment expansion in the non-government sector. Typically, public and private capital formation is targeted. Of course, the opposite dynamics can also eventuate – spending cuts and/or tax increases – if there is an inflationary boom threatening. There are four major MMT-based criticisms of the generalised expansionary approach. First, indiscriminate demand expansion in isolation is unlikely to lead to employment opportunities for the most disadvantaged members of society. Second, generalised expansion fails to address spatial (regional) labour market disparities which are now common within most nations. Third, generalised expansion does not incorporate an explicit counter-inflation mechanism. Fourth, how does generalised expansion address environmental concerns given that market allocations are the basis for the employment expansion? I addressed the regional disparity issue in many academic papers by developing a spatially targeted employment policy, which I referred to as Spatial Keynesianism, in contrast to the bluntness of orthodox Keynesian tools which fail to account for the spatial distribution of social disadvantage. Spatial Keynesianism builds on the understanding that a generalised expansion will not have the capacity as a stand-alone policy to target regions in need of employment creation which may be reliant on a declining industry. Further, aggregate policy is not able to account for feedback or spill-over effects between regions such that social networks and neighbourhood effects transmit shocks from one region to another. This behaviour underpins the observations common in OECD economies that clusters of high unemployment regions or hot spots form as a result of spatial interdependency. Accordingly, public investment is unlikely to benefit the most disadvantaged workers in the economy. We introduced the Job Guarantee, in part, to explicitly provide opportunities for the most disadvantaged workers. The Job Guarantee does not rely on the government spending at market prices, and, then exploiting multipliers to achieve full employment. The latter approach characterises Keynesian pump-priming and as a consequence fails to provide an integrated full employment-price anchor policy framework. Remember the Job Guarantee is a macroeconomic stability framework which makes it much more than a public sector job creation program. A Job Guarantee, by definition, is spatially targetted – an unconditional job offer to anyone who wants to work, irrespective of where they live. Job Guarantee jobs would be designed to support local community development and advance environmental sustainability. Indeed, an environmental criterion could be used to determine which jobs are acceptable for the Job Guarantee, introducing an environmental planning aspect to the policy framework. Job Guarantee workers could participate in many community-based, socially beneficial activities that have intergenerational payoffs, including urban renewal projects, community and personal care, and environmental schemes such as reforestation, sand dune stabilisation, and river valley and erosion control. Most of this labour intensive work requires very little capital equipment and training. Importantly, I have never held out that the Job Guarantee is the only solution available to government. While advocates of the generalised expansion approach usually ignore any role for a buffer employment stock policy, which allows the government to guarantee full employment using automatic stabilisers by purchasing at fixed prices, the fact is that both approaches can co- exist. Second, the Job Guarantee does not replace social security payments to persons unable to work because of age, illness, disability, or parenting and caring responsibilities. Clearly, and emphatically, a mixture of both approaches is likely to be optimal – however, a generalised expansion alone is not preferred. Given that, what are the problems of running a flexible buffer stock of jobs when workers can be bid out of the pool on any day by non-government employers? We considered this question very early on in the development of the Job Guarantee. Indeed, when I first developed the idea of a buffer stock of jobs as an full-employment, inflation control mechanism in my Honours year at the University of Melbourne in 1978, I discussed the idea of a core component and an ephemeral component in the Job Guarantee pool. So lets briefly consider the issue and how we solve it within MMT. Instead of forcing workers into unemployment when private (or public) demand slumped, the Job Guarantee would ensure that all those who would, under the current unemployment buffer stock approach to inflation control, become unemployed would have access to a public sector job at the minimum wage (with attendant social wage components, such as child care, transport subsidies, rental assistance, superannuation, etc). It is clear that this overall aim has implications over the economic cycle and the cyclical nature of Job Guarantee jobs presents an operational design challenge for the administration of such a scheme and the design of the Job Guarantee jobs. These jobs would have to be productive yet amenable to being created and destroyed in line with the movements of the private economic (spending) cycle. While challenging this is not an impossible requirement for public policy to meet. The non-government sector does not have a monopoly on being able to mobilise a diverse range of resources and successfully complete thousands of tasks within a tight and complex schedule. Note also that the non-government sector scheduling is in some sense much less flexible because it cannot afford to ‘inventory’ workers who are (temporarily) unneeded. Job Guarantee can employ workers even before precise tasks are assigned, helping to smooth transitions. The government has a choice between creating employment opportunities on an ongoing basis in what we might call the regular public service or via buffer stock jobs (the Job Guarantee). First, where services need to be provided on an ongoing basis there may be limited scope for Job Guarantee jobs in these industries. Therefore, the suitability of these jobs in a buffer stock model, which expands and contracts with the economic cycle, may be limited. There may still be scope for Job Guarantee employees to perform auxiliary tasks or offer assistance in these industries; however this should not be used as a substitute for an aggregate increase in employment in these industries. The principle operating is that the Job Guarantee should not displace employment in either the non-government sector (unless it is deemed desirable to eliminate certain jobs altogether) or the usual public sector. This precludes it from delivering services within the Job Guarantee, which either the market or the state currently deem worthy of delivery. This means that Job Guarantee services will address needs that are currently not profitable for the private sector to meet (because they are public goods or because potential recipients of the services cannot afford them) and which the state currently considers of such low priority as to not warrant addressing. This does not preclude Job Guarantee services from meeting considerable unmet need in relation to the natural and social environment and among the least powerful sections of society, particularly if the system is well-engaged at the local grass-roots level, where the market and the state generally are not. In the Job Guarantee, the buffer stock of jobs is designed to be a fluctuating workforce that expands when the level of non-government sector activity falls and contracts when non-government demand for labour rises. A core component that represents the ‘average’ buffer stock over the typical economic cycle, given government policy settings, trend private spending growth, and a mismatch of labor force characteristics and employer preferences. A transitory component that fluctuates around the core as non-government spending ebbs and flows. The reality of modern labour markets is that there is a lot of labour force ‘churning’ where most of those who are considered to be officially unemployed transition reasonably quickly out of short-term unemployment. Some might think that this makes the makes operation of a Job Guarantee program more difficult because of the large fluctuations of short-term unemployed. We have always considered that this observation should lead one to the opposite conclusion: many of those losing jobs will prefer to undertake full-time search rather than accepting temporary Job Guarantee work. As we have argued, there is no reason why the Job Guarantee would induce all of those with short-term spells of unemployment into Job Guarantee work. First, the relatively low pay will act as a disincentive for many job losers. Second, many skilled workers receive redundancy payouts and enter what we call ‘wait’ unemployment and prefer that state than taking a low-skill job. They anticipate becoming reemployed relatively quickly when the cycle turns up again. Third, the Job Guarantee could provide, say, up to 6 weeks of pay for full-time job search. The length of job search can be pragmatically and even individually set through consultation with employment counsellors. Fourth, the fluctuations associated with a typical economic cycle are, in fact, not nearly as large as many economists who do not study this data, would like to believe. Past work by the MMT team at various times have estimated that the total fluctuation between peak and trough in the Job Guarantee pool would perhaps be in the range of 25 per cent of the pool at a maximum. In other words, we shouldn’t get carried away in estimating the dynamic range of the Job Guarantee pool relative to the standard labour force categories. In making these ideas operational, it is clear that modelling can provide a guide to the ‘steady-state’ jobs that would be initially offered under the Job Guarantee scheme. This would be a fairly standard task. Administrators would then prioritise work allocations from a broad array of community enhancing activities. In this way, it is unlikely that any important function or service would be terminated abruptly, due to a lack of buffer stock workers, when the non-government demand for labour rises. Thus, the design and nature of Job Guarantee jobs would reflect the underlying notion of a buffer stock. This stock would, in turn, have a ‘steady-state’ or core component determined by government macroeconomic policy settings, and a transitory component determined by the vagaries of non-government spending. In the short-term, the buffer stock would fluctuate with non-government sector activity and workers would move between the two sectors as demand changes. Longer-term changes in the size of the average buffer stock would reflect discrete changes in government policy. It is in this context that we argue for the existence of a stable core, which might change slowly and predictably as government policy settings change, and which would allow Job Guarantee administrators to more easily allocate workers to jobs. Many of these core jobs would be more or less permanent. More ephemeral Job Guarantee activities could then be designed to ‘switch on’ when private demand declined below trend. These activities would not be used to deliver outputs that might be required on an ongoing basis, but would still advance community welfare. For example, Job Guarantee jobs in a particular region might be used to provide regular shopping or gardening services for the frail aged, to support the desire of many older persons to remain in their own homes. It would not be sensible to make the provision of these services transitory or variable, and they would thus be provided from the core buffer. Clearly, these services could be reassigned to become ‘mainline public sector’ work if a political shift in thinking occurred. The structure of these jobs and the remuneration paid would however not be altered as a consequence of this political shift. Other ‘off-the-shelf’ projects would be undertaken or completed only when the Job Guarantee pool expanded sufficiently. In Part 2, tomorrow, I will consider the ways in which MMT operationalises the Job Guarantee pool. That is, what policies does it use to expand and/or contract the pool. It is much more complex than just hiking (or cutting) taxes. (c) Copyright 2019 William Mitchell. All Rights Reserved. Thanks, Bill. I now think I’ve got why JG jobs must be different to the ones which I consider essential for a Corbyn government – essentially their temporary nature. I have been arguing that there is no need for a JG in a socialist state. A friend who used to live in France told me of a scheme which gave work to young unemployed. He said that the young man who was ‘gifted’ to his village was popular with the community, doing all sorts of useful work, especially for the elderly. I’m not sure how long ago this was. Perhaps worth researching. Can tour guides and coaches be included in a JG? Can think of side of a motorway, trim down a row of trees, open source programming, social care, enviromental work e.g. stablising sand dunes, etc? Dig the concept of Spatial Keynesianism. It contrasts with the oppositional concept of geographical neoliberalism. 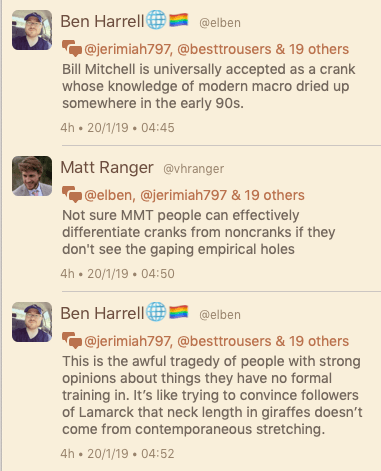 Ben Harrel’s second comment is ironic, seeing as he is one of the hypothetical followers of Lamarck. Haha! Universally Accepted Crank is a title you should wear with honour. How does Professor William Mitchell, Phd, M.Ec, B.Com, UAC look? It must take the patience of a saint to be a teacher. Facing the same questions year after year from people like me, even if we are trying to learn. At least you happen to HAVE good consistent answers for the questions- consider the poor mainstream economist who gets a question about why the money multiplier theory isn’t seeming to work, or why a giant increase in the base money hasn’t caused inflation, or what the heck is going on with their NAIRU theory. They either have to improvise or make things up, which sometimes is about the same thing. The JG, as Bill clarifies it, strikes me as only a good beginning, a way to get the federal foot in the door as the employer of last resort. It reminds me of the “public option” that was initially proposed, then quickly rejected by the PTB, when Obamacare was being cobbled together. With regard to American healthcare, the goal of many who advocated for the public option was not merely to compete with for-profit health care providers but to demonstrate that government could outperform the private sector in this area, laying the path for Medicare for all or a similar single-payer system down the road. Isn’t the same true of the JG? While it begins with a modest proposal for the federal government to take up the employment slack when the private sector can’t or won’t provide sufficient jobs, isn’t the ultimate goal, however distant at the moment, what Bill and Tom describe in “Reclaiming the State” as a “socio-ecological transformation of production and society;” i.e., some form of eco-socialism? Or is this a case where it’s simply not prudent to say such a thing at the outset, but instead advocate for only a useful adjustment to insure a more smooth-running and efficient capitalist status quo? Or am I simply wrong from the outset in seeing the JG as an important first step toward much more comprehensive socioeconomic change, which, however difficult, strikes me and many others as urgently necessary to preserve not only economic vitality but also the long-term existence of life on this planet? Is it possible for a JG to be be run as follows? The JG pool would consist of all those who wished to enter two years elective employment with the Public Service. Essentially, these people would be embedded and trained in the department of their choice. Then they would perform basic duties under supervision, continuing to learn on the job. During this process, a reconstituted CES (Commonwealth Employment Service) would assist these people to apply for private enterprise jobs if they wished. They would likely apply for jobs for which their current training was applicable. They would get advice and training on interview skills, resume writing etc. They would get time off work at full pay to attend interviews and other requirements of the job search. After two years, if unsuccessful at getting a private job, they would receive a permanent PS job offer if they were competent and desired a a job there. The general idea would be that the JG would be a training or re-training ground for basic job skills. Those newly attached to the JG would be those most likely to still be considering entry or re-entry into private sector jobs. Thus it is a holding and training ground which does not prevent job search, indeed facilitates it gets assistance from the CES. In a private sector jobs boom, many of the “second years” in particular in this system would likely get job offers directly channeled through the CES. As a mother, I have had great difficulty getting paid work that fits in with school hours, despite wanting to work and contribute more. Private employers just aren’t interested really as children are an inconvenience to them. It is often a very lonely and isolating existence as a result (though it leaves time to read about MMT). I don’t think I am the only one who feels the same kind of entrapment. A Job Guarantee that would employ parents who wanted to work between 10 and 2.30pm say on a part-time basis could have huge benefits for caregivers who feel trapped at home but don’t want to hand over their kids to after school childcare in order to work full-time. I would happily do shopping for the elderly or garden or clean a river bank. As long as I can leave by 2.30 and maybe not work 5 days per week. I really hope a Job Guarantee can be designed to help women who I suspect make up a large part of the underemployed. The JG program is not good enough for the upper middle-class people who get laid off. These people would probably get a larger check from unemployment and have more time to look for a new job. The JG is fine for the lower-class and much of the middle-class, I think. Could limiting unemployment to just workers who make more than some amount be combined with the JG? Maybe with some middle area to smooth out the jump. Also, a worker in the JG program needs to take time off to look for a better job in the private sector. Is this time off unpaid? Do MMTers care that unpaid time reduces their income? Please stop making things up. Do MMTers care that unpaid time reduces their income? Where do we ever say anything remotely like this? This is the problem out there in social media. People run their own narratives about what MMT is or isn’t then further degrade the situation by extrapolating totally false inferences from things they make up and then suggest we think along those lines. To my suspicious mind, it seems unlikely that Ben Harrell above is incapable of doing a little web-search and finding out that Bill is actually a fully trained academic, with a long string of peer-reviewed research publications. I would put him down as someone who is deliberately spreading falsehoods to “discredit” MMT. I suspect that people like Ben Harrell and Matt Ranger are trolls, doing what they do best – behaving destructively. You are not kidding. You have the distinction of being the one person in all of human history that I have read more from than any other. And I consider myself to be quite a reader and fairly well-read at that. Blew Tolstoy away years ago. J.R.R. Tolkien fairly soon after that. Not that reading your blog is the same experience. Thanks. And keep it coming. Keep up the good fight Bill … I’ll keep pushing for change too.